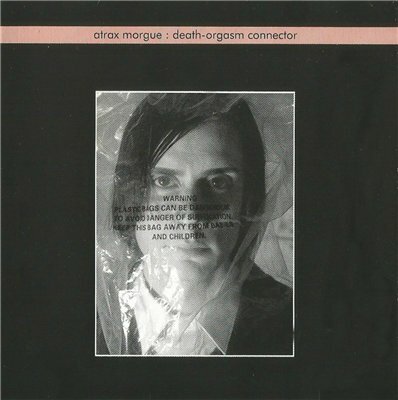 Atrax Morgue was the nom de plume of Italian noise musician Marco Corbelli. 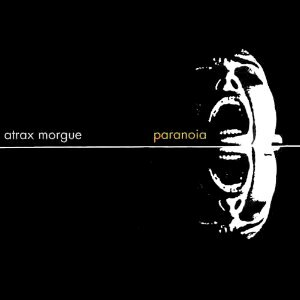 Many of Atrax Morgue's early material was released on cassette, as part of the industrial/noise 'cassette underground' of the early 1990s. 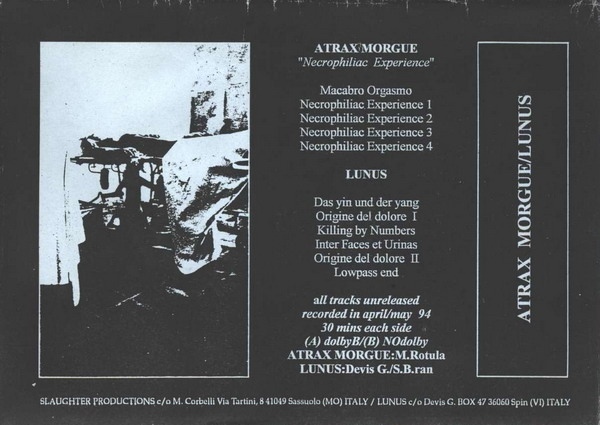 Often these cassettes were released on Corbelli's own Slaughter Productions label, some of which have now been reissued on CD-R. 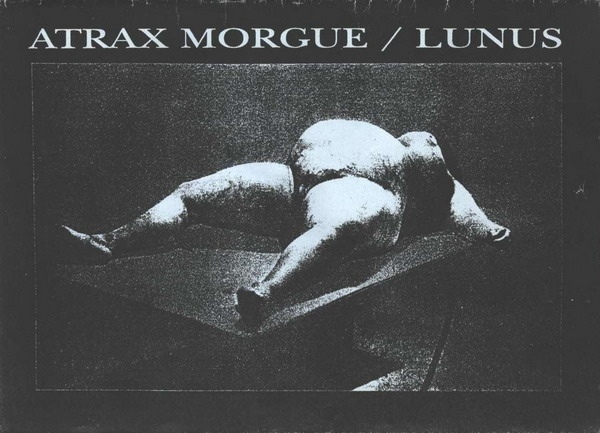 Throughout the late '90s, Atrax Morgue released numerous CDs on prominent noise labels, such as Self Abuse Records, Release, Old Europa Cafe, RRRecords, Crowd Control Activities and Ars Benevola Mater. 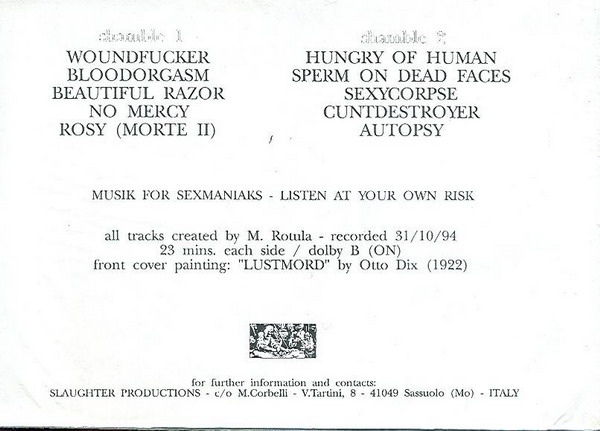 Recorded July 1993 at S.I.D. Studio. Cassette with a sticker label on the A-side packaged in a standard snapcase with a j-card; this snapcase is stuffed in a latex glove. Also includedis an 8-panel foldout art insert titled "Aseptic Visions", which is pierced with a hypodermic needle. All of this is housed in a VHS box with a cover printed on plastic transparency. Subtitled on the font cover of both the VHS box and the snapcase as "Death injection part II/III". 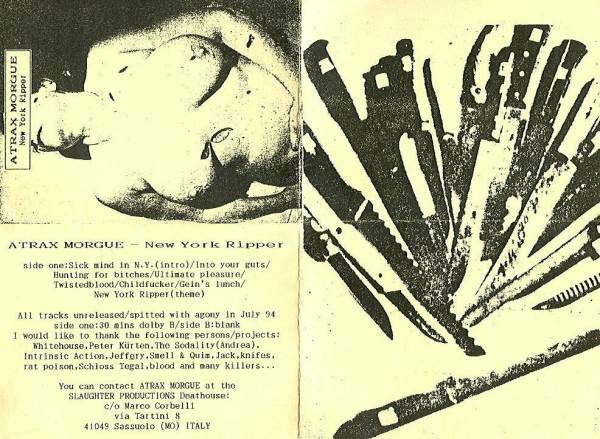 On the back cover of the VHS box, the tape itself is titled "DEATH INJECTION PART II: The psychopathology of sounds", white the accompanying booklet is titled "DEATH INJECTION PART III: ASEPTICS VISIONS". "All tracks spitted in feb. 1994." Track 5 and 14 are inspired by Mario Bava's "The Telephone". These Tracks were made using spoken parts from that movie connecting a series of old portable tape recorders to a mixer. 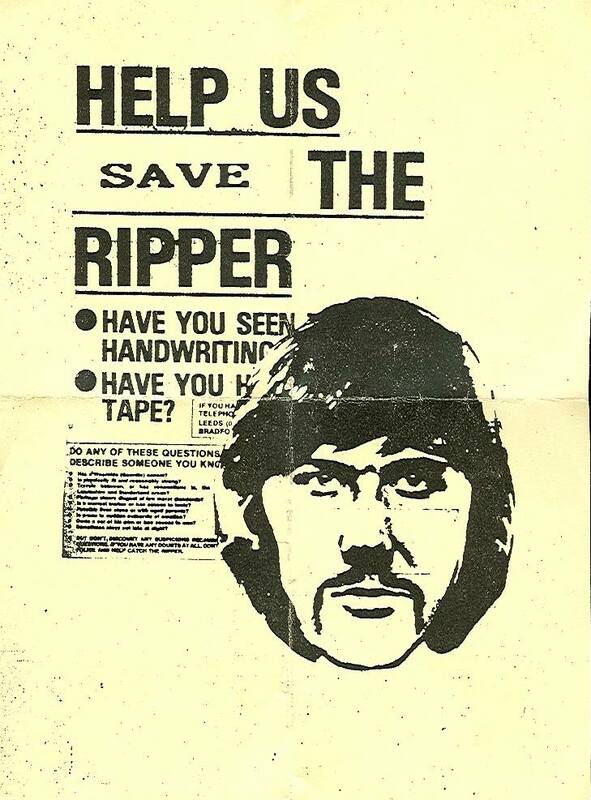 I was wearing black leather gloves during these operations. 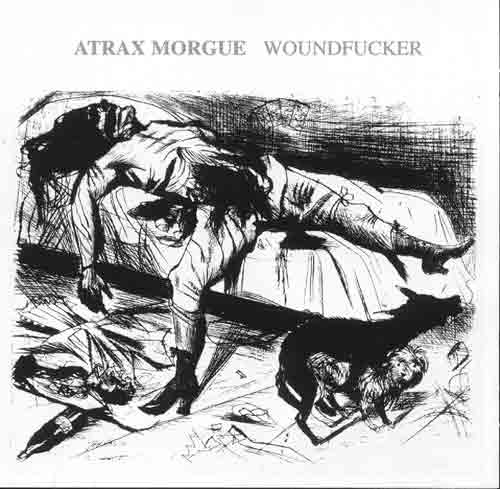 All Vocal abortions and electronics by Atrax Morgue. Cover photo by Denni Lugli. Inside photo by Killnoir. Graphic concept by A.M.; layout by djNoorglo. Recorded at SweetSlaughter, anno 2001. Killnoir, Dr. Antonio Foglia, Where, Tairy, djNoorglo.